Detective Sergeant Ali Green has been called back off sick leave to deal with an emergency relating to an earlier case relating to a series of girls from Norfolk who have disappeared and believed to have been abducted. Having tracked the supposed abductor to his lair, the police find a cage in which the girls have been incarcerated. But he escapes with one of the captive girls, leaving Ali’s boss dead and herself and one of her colleagues badly hurt. Subsequently, two further detectives disappear while on a further attempt to track down both the suspect and the missing girls. Later their bodies are also discovered in the burnt out wreck of their car. A further search reveals the bodies of several of the missing girls. But what exactly is the role of Erica Shaw, one of the girls who was abducted, but who appears to have helped his original escape from the police, and to be implicated in the later murders? While her superiors believe the girl may have turned rogue killer in a Stockholm syndrome effect of her abduction, Ali believes the girl to be innocent and still operating under duress from her abductor. The story continues at a pace, sometimes outpacing the reader’s capacity to follow. The finale vies in excitement with the prologue which kicked the book off. And all that might be sufficient to secure the ready interest of many readers. But if you like to see a range of robust characterisation, a clearly delineated plot, and more than that a strong sense of place you may, like me, feel a degree of disappointment at some of the book’s superficiality. 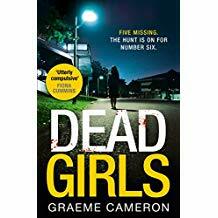 Dead Girls follows closely on the author’s first book, so closely there is a wham-bang prologue which compresses the finale of Normal, and my copy I read also carries the first four chapters. Sadly, both these devises don’t fully help and reader who embarks unwittingly on Dead Girls. I was certainly lost for some time, confused over characters and events. So, if you want to get the full benefits of Dead Girls, read Normal. But even that preparation may not resolve all the issues with Dead Girls. Firstly it is a very jumpy text, often very difficult to follow. Several of the characters flit in and out and rarely achieve any real body or attract any great interest. Sadly that applies also to the principal character, Detective Sergeant Ali Green. Ali is much like several other female cop heroines – she’s feisty, doesn’t get on too well with superiors or obey orders very willingly, preferring to investigate in her own way, using her own methods. But there are also some variations. Having suffered a head wound in the first book she still suffers the effects, a degree of forgetfulness, a tendency to talk out loud what she thinks are her thoughts, and periods when neurological problems cause her leg to collapse on her, even after a period of leave and counselling. Her sexual orientation is flexible. An earlier divorce has seemingly disposed of a husband and her interests now relate more to women. That said, even these relationships appear pretty shallow, like quite a bit of Ali Green herself.